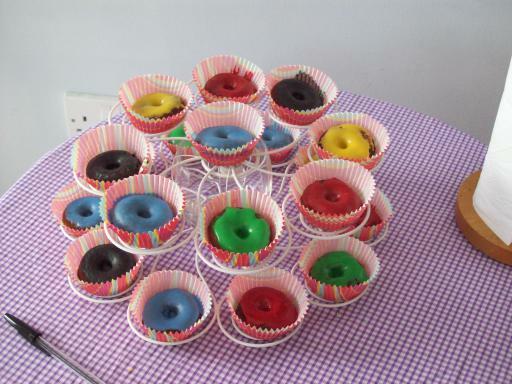 I made these ring cakes to celebrate the Olympics today – I put cake mix in our doughnut maker. I creamed these ingredients together and snipped the end off of a disposable piping bag and filled it the cake mix. I then pipped this into the doughnut machine. I had to do a bit of trial and error to work out a good amount. I found filling the troughs up and closing the machine for 7 minutes worked best. I had an issue with them falling to pieces as I was trying get them out of the machine but found that if I slightly over filled so that an apron of escape mix surrounded each ring then I could use this to pull the rings out. I then snipped the excess cake off with scissors. I then poured out a bit of fondant icing mix into five bowls and added food colouring for each of the different rings of the Olympic flag. I then added a bit of water to each until I got the correct consistancy. I then duked the rings and popped them into some nice cake cases that I thought matched the abstract sporty look I was going for.